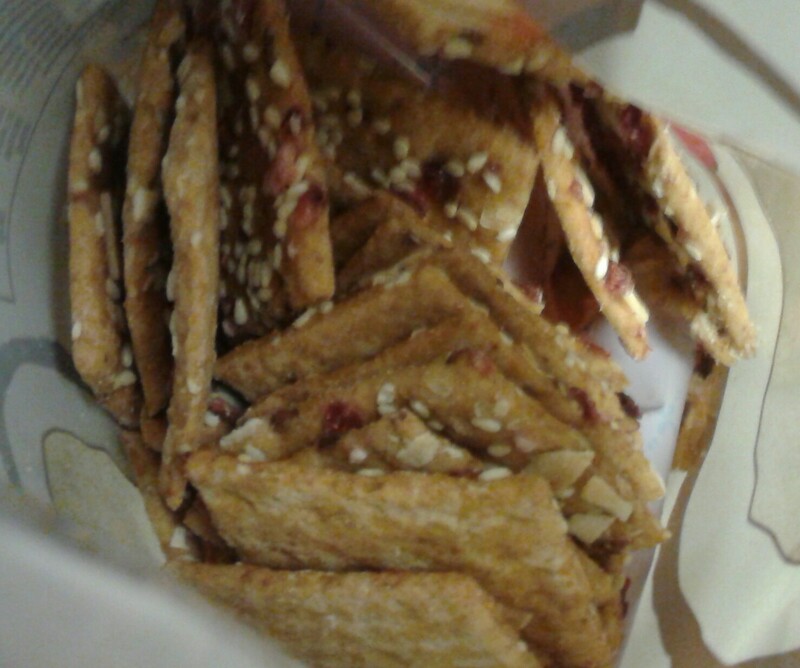 Much like hockey, reggae, and amateur competitive facial hair cultivation, there's a lot that I *want* to like about Trader Joe's Cranberry Coconut Snacking Crackers....but I just can't. Sorry. It's probably unfair, but the wheat snack crackers I compare all others to are Wheat thins - light, crispy, irresistibly munchy. That's kinda the standard. Well, these wheaty wafers are wanting in comparison. They're much denser, and heavier, without that nice requisite crunch, and they somehow dry up the entire inside of my digestive system. Literally, after just three or few, I'm coughing up crumbs everywhere. These crackers do taste somewhat okay, though. Aside from the textural shortcomings, there's nothing all that wrong with the actual cracker itself. I can see but not taste the coconut flakes, mostly because it's too subtle a flavor compared to the wheaty base, the raisins and cranberries (nothing much to say about them)...or the sesame seeds. Umm, who invited those to the party? While not completely unwelcome, it's an odd add-on to say the least. I think it says something that in a household of three carb-crazed adults and two kiddos who will happily devour anything that can reasonably be called a "cracker" that we still have over half the modest sized bag of them remaining after a few weeks now. I think there's potential - I bet a good piece of chevre could put in quite the assist - but neither Sandy nor I particularly enjoy them. We'd love to, but it just ain't there. Matching twos. I wasn't expecting them to taste much like wheat thins, so I thought they were pretty okay. I agree that they are rather dry.